The APY Executive Board met yesterday the 29th March 2016. It was noted that the communities across the APY have been devastated by this sad event and are in mourning for the loss of this very special lady. After some discussion and consideration the executive have decided that the APY and our communities will need time to come to terms with their loss. The APY Executive has requested that the Community Cabinet that had been scheduled for May 2016 be deferred for a later date to allow the APY communities recover. Reminder to all! The Countdown is on. Anangu Pitjantjatjara Yankunytjatjara (APY) CHOIR will be performing at WOMADelaide this Sunday 13th March, 2016 at 5.15pm. Make sure you get in early, for a show not to be missed. Check out WOMADelaide Website for more information: www.womadelaide.com.au. For those people not able to be in Adelaide please tune in to 5NPY, this broadcast will be proudly brought to you in partnership with APY Administration and PITJANTJATJARA YANKUNYTJATJARA MEDIA, the Performance will be Live across the Lands. 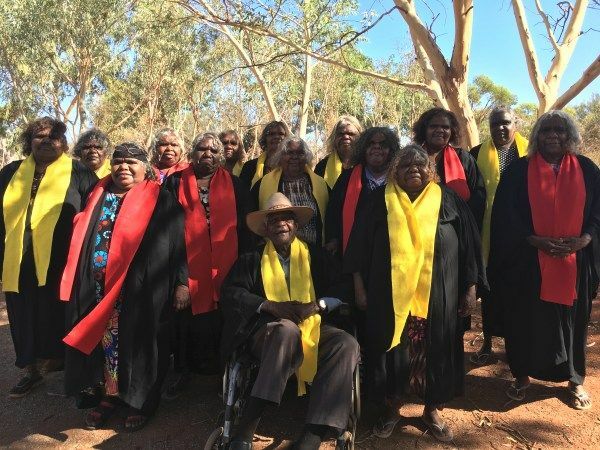 The APY Choir has been formed as a combination of some of the originals from the (Ernabella Choir) it includes the children of the Choir members and also children who attended the Ernabella Mission School. The APY Choir perform regularly at funerals and special events; they have been selected to form the APY CHOIR to perform at WOMAD, 2016. The Choir sings in ‘Acapella’ in their own language of Pitjantjatjara, Choir Members are representatives from the APY Lands Communities. This Choir brings the Old and New together in forming the APY CHOIR for 2016. On behalf of the APY Executive, General Manager, Director and staff we wish the APY Choir every success with their performance. We look forward to sharing more of the story with you in the weeks to come. Anangu Pitjantjatjara Yankunytjatjara is pleased to announce that Members of APY formed a new committee which is called “The APY Law and Culture Committee”. The APY Law and Culture Committee are scheduled to meet on Tuesday the 8th December, 2015. Please Note: This committee is not to be confused with the recently established Pitjantjatjara Yankunytjatjara Law and Culture Pty Ltd run by Mr Murray George. This Company does not have any standing to carry out functions on behalf of APY Executive Board under the Anangu Pitjantjatjara Yankunytjatjara Land Rights Act. The group have chosen to become fully independent of the APY Executive board and seek independent support for their activities.